I am old enough to remember when there was either no such thing as blue nailpolish, or if you wore it, it was a subversive thing. Now, I love blue polish, and I can't seem to get enough. I really like this Pure Ice suede, Blue Midnight. Nice formula, like all the others. It's the only cobalt blue suede I've come across, though. I wanted to try a gold tip and stripe using another Pure Ice suede, Over The Top. Obviously, my freehand stripes need a little work! Another 'subversive' color of polish - black. Now, it's everywhere, and I love to wear it, too, though not often all by itself. I love layering with it or using it for nail art best. It's hard to cover up such a neat texture, though! Pure Ice Black Velour didn't have a clear suede finish - it's almost a 'rubber' or 'soft touch' finish - not quite matte, but lacking in the silver particles of the suedes. I told you I need practice striping! I tried 5 different types of stripes with OPI My Boyfriend Scales Walls. This polish made a huge splash when the Spiderman collex hit - it's not a true white, nor is it really grey. It's just a touch off-white, like an eggshell. How do you like to wear your suedes? ....and then forget to take a picture. It was probably too intimate or something. It's a red-purple suede. You can see it in the background of my dotticure.. I used Color Club Harp on it, a holographic polish, but over the suede, it took on more of a suede finish! I also dotted with other Pure Ice Suedes, including Blue Midnight and Stunning. Next suede is Pure Ice Over The Top. I don't usually buy gold polishes. I only bought this one because I was curious about the gold suede, and it was less than $2. It isn't a color I find terribly flattering on me. I do like it as undies for this Perception Nail Lacquer Fall Breeze, however. It lightens up the brown and gives it a glow. Really makes that scattered holo come to life! Too bad Perception closed up shop. She made nice scattered holos. Have you fallen for an Indie that's closed up shop? Who would have thought that Pure Ice would come out with some very cool LE Suedes? I guess when Revlon bought them, they stepped up their game. This first suede is a lovely dusty pink with the gross name - Grunge. These are half the price of the (sale) price of the Avons, at $1.97 at Walmart. You'd never know how inexpensive they are, though - they apply and look like the big brands.. Forever 21 had a 99-cent sale on some of their Love & Beauty polishes, and I thought this purple/multi glitter would look good paired with Grunge. Pure Ice Stunning is just that! A bright fuchsia that pops. Are you into the suedes yet? More, MOAR to come! Avon Soft Violet is such a pretty suede, and it is rumored to be a dupe for OPI Lincoln Park After Dark Suede. It just looks so rich! I also used rhinestones on and around the fimo, gleequins (glitter sequins) and mylar butterflies and moons. Doesn't this mani belong on one of those Japanese nail art magazine covers? HAHAHAHAHA!! Yeah, you know I picked that stuff off two seconds after I snapped the last picture. On to more serious colors - this is Avon Blue Royale. This may well be my favorite suede amongst the Avons. I bought some foils from Dollar Nail Art but I'd never used them before. I found a video on You Tube that explained it pretty well. On my ring ringer, I did the whole nail with Aegean Tides foil. On the other fingers, I just dabbed some random glue patterns and then applied the foil. I thought the suede and foil looked pretty cool together. Still more suedes to come! Then, Avon put their suedes on sale, and I jumped in, and boy, am I glad I did. Avon Sumptuous Rose is delicate, rosy, with a golden glow. Suedes are smooth to the touch, not textured, and they're not really glitter, either. The only way I can think to describe it is like a matte foil polish - there are multiple visual layers to the polish, like a foil has the color and the silver layers. 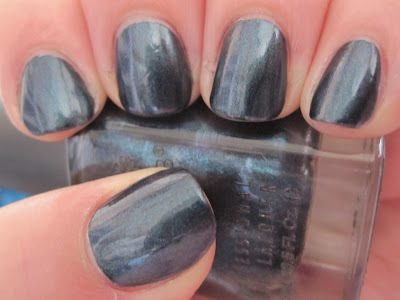 As my first suede, of course I had to see what it looked like with a glossy topcoat! It looks more like a traditional microglitter here, not as delicate, more bold. The second Avon Suede I tried was Fuchsia Feel. This one has the same great suede finish, the formula was a little thicker, but not unmanageable. I love that suede look. I decided to pair this one with Shimmer Natalie. I freehanded the glitter half, and only did topcoat on the glitter. I love the contrast between the suede and the glitter! Are you into the suede trend? I'll be showing you different suedes all week long... stay tuned! I like to layer my colors, who doesn't? But I didn't mean to layer so many! I started off with a franken I bought of China Glaze 2night. 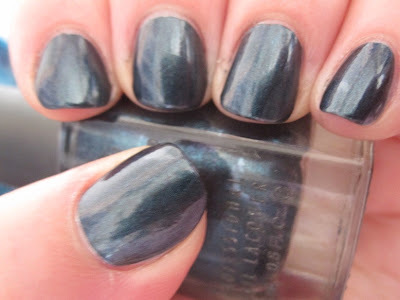 I looked at swatches online, and I know that 2night is a denim blue holo. This is not. I think I like this more, though! I wish it were a little more holo (though it was in RL, I wasn't able to capture it in the pix inside) but I really love this cornflower blue. But I wanted a little more holo, and my new Dandy Nails Moonglow was beckoning me. 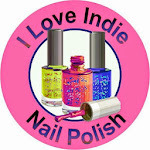 Dandy Nails is quickly becoming one of my fave Indies. Her polishes just don't disappoint. They are great. I love her micro-glitters, too. 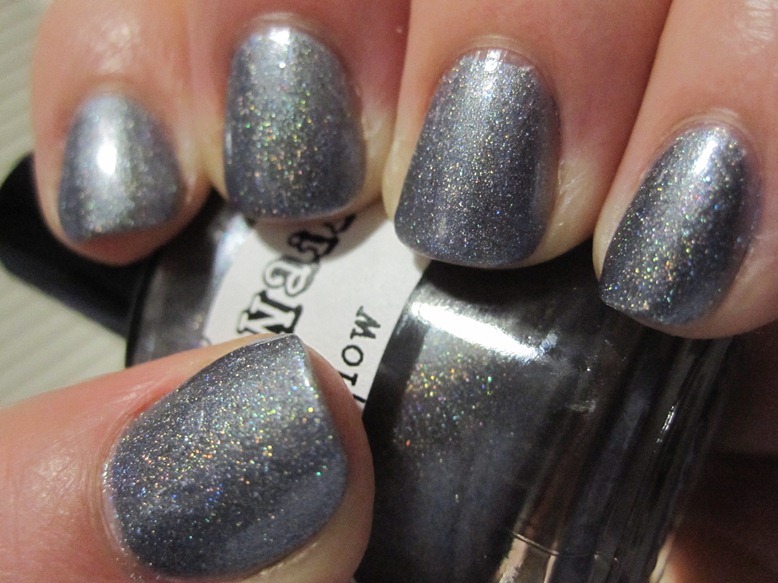 Moonglow is grey/blue/purple with a subtle linear holo. Gorgeous. But then I checked the Adventures in Stamping page, and found that we were supposed to stamp over blue. I *just* covered the blue! So, I had to cover Moonglow, and I chose Color Club First Looks, a deep, shiny blackened teal. Sorry about the lobster hands, I was trying to capture how dark this polish is, but my camera kept picking up all the light. This polish isn't black - you can definitely tell it's a teal, but it's a little darker than I was able to photograph. So at this point, I'm wearing three different color polishes in layers, but I still have to stamp! 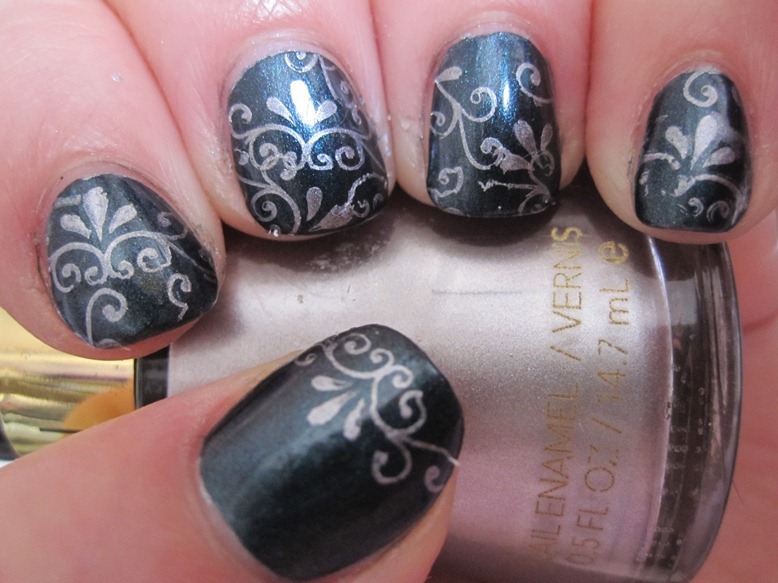 I chose Revlon Silver Screen and Mash - 27 for my stamping. My thumb has the closest representation of the whole stamp. On all my other fingers, I took different sections of the same stamp and put it at different orientations. I am in love with this look. My nails are chipping and peeling from all the different layers of polish, but I still haven't taken it off! 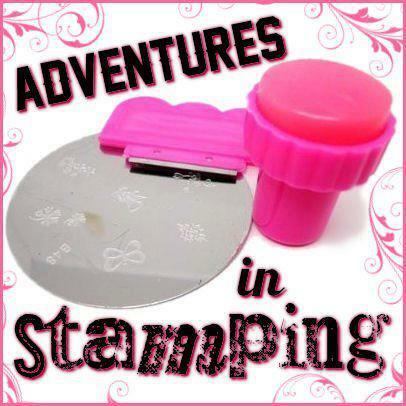 Are you stamping on Sunday? A good brown and .... a not so good one. Guest Post on Ruby's Nails! The Makeup Show - Orlando!